March is Colon Cancer Awareness Month, and probably the most important fact to be aware of is this: Everyone is at risk of colon cancer. You may think of colon cancer as something that only happens to older people, but colon cancer diagnoses in the 20-49 age group are on the rise. These diagnoses are often made later in the disease due to a lack of awareness and screening in this age group. 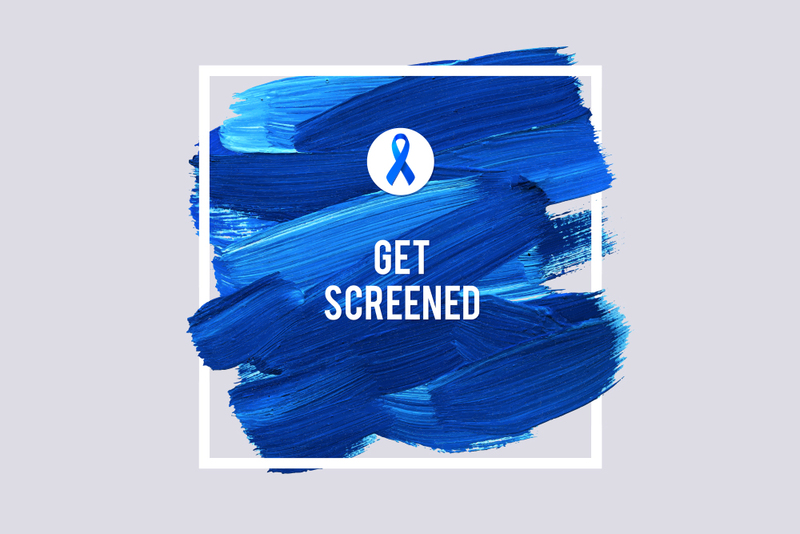 This means everyone needs to be aware of their personal risk of colon cancer, its symptoms, and the importance of reliable screening. Despite the rise in colon cancer in younger people, 90 percent of colon cancers occur in people over 50, so increasing age is a risk factor. First-time screening colonoscopies are usually recommended at age 50. However, African Americans are at a higher risk and should have the first screening colonoscopy at 45. A personal or family history of colon cancer or polyps or inflammatory bowel diseases (IBD) can also be risk factors, and your physician may recommend an earlier colonoscopy. There are a number of options for colon cancer screening. The most popular are at-home colon cancer screening kits and colonoscopies. Both screenings have their advantages, but only one can detect and prevent colon cancer. Low “retail” price—most kits have a lower price point than procedures at a hospital or outpatient center. In many cases, these kits are covered by insurance. However, if you get a positive result, you will need a diagnostic colonoscopy—costing you even more money. Enhanced convenience—a colon cancer screening from the privacy and comfort of your own bathroom. At-home screening kits are not 100% reliable. Thirteen percent of people using them will get a false positive. Research has shown that at home screening kits have a lower accuracy—8 percent of colon cancers are missed and 58 percent of potentially precancerous adenomas go undetected. At-home screening kits provide no preventive measures. If you get a positive result, you have to see a gastroenterologist for diagnosis and treatment. Screening colonoscopies are considered a preventive procedure and often covered 100 percent by insurance. Even if you have to pay some or all of your procedure costs, screening at an independent ambulatory surgery center costs a fraction of what hospitals and hospital-affiliated surgery centers charge. If detected and treated early, the survival rate for colon cancer is 90 percent. Only a colonoscopy can provide the thorough, specific, and accurate screening you need. A high-quality colonoscopy is affordable—you don’t have to pay more to get the best. Choose a fellowship-trained gastroenterologist with a high adenoma detection rate (ADR) and book your appointment at an independent ambulatory surgery center with industry-leading AAAHC and CMS safety and quality certifications. These centers typically charge much less than a hospital or hospital-affiliated center. Book your colonoscopy with confidence at the state-of-the-art, AAAHC and CMS certified Tulsa Endoscopy Center. It is staffed by fellowship-trained and board-certified gastroenterologists, and highly experienced support staff. Costs are low and the center accepts most insurance plans, with cash pricing and payment options available. It also offers accessible parking and convenient curbside patient drop-off and pick-up points. Click to request an appointment or learn more about Tulsa Endoscopy Center.